Audi May or May Not Bring the Q3 Crossover to the U.S. The Audi Q3 crossover could come to the U.S. in 3 years after a refresh of the German line. Audi is still undecided as to whether to bring the new Q3 crossover across the pond. Americans love the small crossovers, however the German automaker is still considering the market for a luxury compact crossover. The Q3 runs on Audi&apos;s new 300hp 2.5-liter 5-cylinder TFSI engine. The output alone should be enough to placate the horsepower-hungry U.S. market, and this could be one of the best compact luxury crossovers to make its way over. 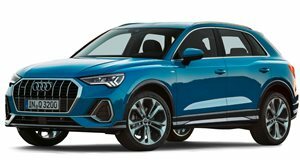 Audi wants to bring them to the States, however they still need to find the right price to sell their crossovers and still turn a good enough profit. A mid-cycle refresh is scheduled in three years&apos; time, and that looks like the opportune time for Audi to finally introduce them to the U.S. market. Audi has plans to also bring their A3 sedan to the States in 2014 and the Germans could also bring their A2 over here, as long as they make good on their plans to revive the compact in Europe first.